Now I learned to drive in Las Vegas, and that place is a damn hodgepodge of bad drivers from everywhere else. And I’m not just tossing that out of spite or anything, but it’s the truth because infrastructure is so much different than other places that it is in the land of road rage and child neglect that is Southern Nevada. And it is infrastructure that has a larger impact than you think upon driving customs. Until I started traveling on business trips across the country that allowed me to explore such exotic locals like Ohio, I never realized this fact. It’s not always that other people are “bad” drivers, it’s just that their driving skills, and more importantly habits simply do NOT match their new environments. And it’s as eye-opening as it is depressing when you see what other people have to put up with. 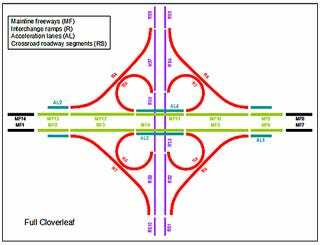 Low-volume, cloverleaf traffic interchanges in the Midwest don’t have acceleration or deceleration lanes. There is just a lane on sometimes a rather short bridge as you can see in this handy-dandy accompanying picture. So as soon as you get on, you have to immediately change lanes and THEN speed up. Or cut over and quickly hit the brakes. Because if you don’t, you just wind up getting dumped onto a lane going in the opposite direction, or otherwise just miss your turnoff entirely. Which is a truly awful habit people have where they end up always cutting you off either to get over, or after they’ve gotten over they slam their brakes in front of you. And then there is Texas with long double-white lines on the merging sections of the on and off-ramps. And if you cross them, it’s a nice fine that cops in the Lone Star State just LOVE to write tickets for. Needless to say, people from Texas tend to be gun-shy about merging lanes. So you get the mix of people that suddenly cut over without warning, and the others that won’t friggin’ move to let you over at all. Why? They’re just not used to any of this. Acceleration lanes: Given the facts of those aforementioned short lanes in the Midwest, some people will just come barreling out into traffic like a damn rodeo bull out of the chute. And then in places like the Southeast with low-volume highways and byways, there’s always plenty of time to stop, rather than simply yield so you can keep going. Intact, in lots of cases, they don’t even have acceleration lanes, and the low traffic volume dictates that they should stop. Which again is why some people drive like maniacs, and others just congest traffic behind them on the damn ramps. They’re scared because they’re just not used to the need to quickly accelerate. Oh, and one more thing too about the South. Given the fact that there are not only a lack of acceleration lanes on many highways, there is also the small town mentality of trying to be ultra-polite in traffic. Whether this is a sign of genuine good-will, or just the fact that people are afraid that the other person is someone they know (which somehow happens I can attest to. Even in Houston, I have randomly run into my in-laws at random times across the metroplex for some inexplicable reason), it’s unknown. But people will slow down just to try and be friendly to let the other person pass. Also, for everyone’s sake, please do not take this sign too literal. Do yourself a favor, and don’t simply drive friendly. Drive intelligently. Intelligence leads to courteousness. Friendliness does not. Mentally handicapped people are friendly, and we do not let them drive, now do we? And as you know, there is a very good reason for that. I’m sure that most confused elderly drivers out there who have mistaken the gas for the brake pedal and caused a crash are friendly people. But now matter how cheery you are, that does NOT make up for a lack of driving ability. So don’t be friendly. Be intelligent and responsible. Dual Left Turn Lanes: In Nevada and California the Inner LTL may only go to the inner lane of the next street, while the Outer LTL can choose either the middle or the outer lane as necessary and applicable. As you can easily see below in a satellite picture of Sahara & Decatur in Las Vegas. On if the valley’s busiest intersections. Just follow the turn lane markings (ignoring the leftover accident debris in the middle of the intersection). In Texas and other states, no, it’s completely reversed. The outer turn lane is locked into only the outer lane of the street you’re turning onto, and the inner lane gets free reign of the inner or middle lanes. So you constantly get people trying to occupy the same lane at the same time, and it results in massive confusion and anger. No one is trying to be the boss of the road, they’re just assuming that the other driver is wrong based off their own driving habits and the laws they’re used to. Especially in both Nevada and Texas where as more Californians move down south, the amount of out of state plates indicates that Texans are fleeing to Nevada for some reason... Texas Hold ‘Em maybe? I’ve no idea. Left Turn Yield on Green: The Midwest and Southeast has never even heard of such a thing, and is perpetually confused by the concept that a green light means that they don’t have the right of way. Driveways: This bugs me the most. I absolutely HATE it! On the west coast, driveways have full aprons. Meaning that on each side of the driveway, it’s a full ramp that flares out to the street, and may have a minor inch or two drop-off. Why? Because the curb continues in a straight line, but then dips down to the level of the driveway. The dips in the bent result in two isosceles triangles on either side that make up the apron, and make tight turns in and out possible. So if you take too tight of a turn entering or exiting a driveway down South, you’re going to be driving over the curb and slamming your tires into it, or off of it. Not fun at all. So how do you avoid it? 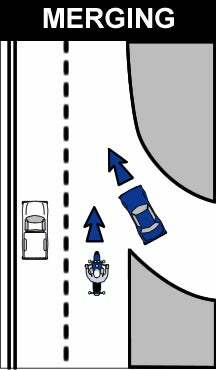 You absolutely MUST swing wide turns everywhere you go like you’re pulling a trailer. Which explains why when you’re turning, you’re always veering into other people’s lanes. And in order to avoid compressing your spine, or damaging your suspension (as I have), you need to turn wide. And this is one of the worst habits that transplants just can’t seem to break. Off of Carey Ave. in NLV is this fine example brought to us via Google Earth’s Street View camera. Sure we see the obvious sings of people carelessly driving over the island by the tire marks and the displaced decorative rock. Not just on the curbs, but across the entire thing. What isn’t apparent, aside from the square posts that the city gave up on replacing after consistently being knocked down, are those large rocks in the center demonstrating how often this happens. Back around 1996 or so when this intersection was first converted, those used to be huge, and I do mean HUGE boulders. Almost 2 DECADES of bad drivers have been slamming into those once boulders as they speed through this neighborhood, and knocking them down into little rocks as they have been slowly fracturing after every impact. I suppose that it just goes to show no matter what, some people will never learn something that is new to them. Adaptability may be an amazing trait of mankind, but not so much for an individual.